On Saturday last two young ladies left town in a sulky for the purpose of spending the afternoon on the tennis courts out Old Dubbo way. The greater part of the journey had been safely negotiated, and everything seemed to be going on as merrily at the proverbial marriage bell, when without much warning the horse became restive (presumably on account of the constant "chinning" that was going on behind him). He blinked anxiously round and finding that this rather increased the vexations and unusual noise he bolted. Choosing a soft patch, he turned the occupant out, fortunately or otherwise, on to a thick bed of Scotch thistles, where they were discovered shortly afterwards busily engaged in extracting the sharp points of the noxious weed. It is stated that the horse watched these interesting operations with equine curiosity, and presently agreed to resume his journey under conditions less distracting to him. SALTER v. MOORE. C. J. Salter proceeded against W. Moore for breach of contract, under the Masters and Servants Act. Mr. Booth appeared for complainant, Mr. Fitzhardinge for defendant. 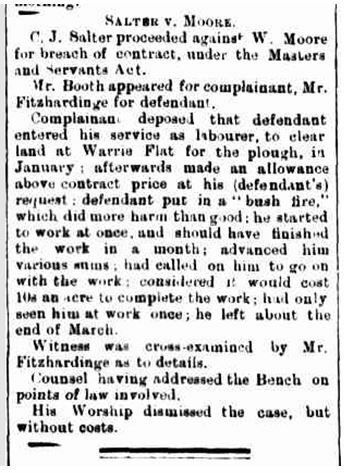 Complainant deposed that defendant entered his service as labourer, to clear land at Warrie Flat for the plough, in January; afterwards made an allowance above contract price at his(defendant's) request; defendant put in a "bush fire", which did more harm than good; he started to work at once, and should have finished the work in a month; advanced him various sums; had called on him to go on with the work; considered it would cost 10s an acre to complete the work; had only seen him at work once; he left about the end of March. Witness was cross-examined by Mr. Fitzhardinge as to details. Counsel having addressed the Bench on points of law involved. His Worship dismissed the case, but without costs. Salter v. Fitzell. Mr Booth appeared for the complainant. The defendant, Julius Fitzell, was charged with assaulting Charles James Salter, and also with using abusive language to him. The complainant said he was at Malin's farm during the sale there. Defendant was also present. A tank was put up for sale and £l was bid for it. Complainant bid 21s, and it was knocked down to him. The defendant then called him "A b-thing, a b-crawler, a b-liar," and used other language. Fitzell took off his coat and assaulted complainant. 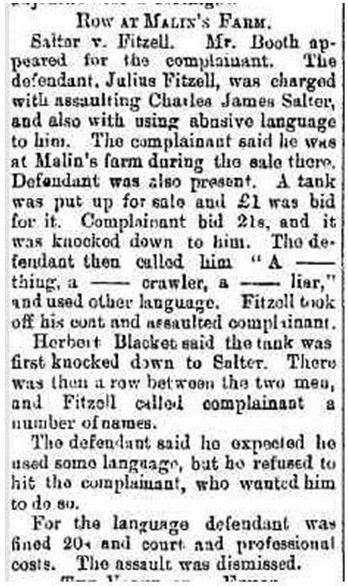 Herbert Blacket said the tank was first knocked down to Salter. There was a row between the two men, and Fitzell called complainant a number of names. The defendant said he expected he used some language, but he refused to hit the complainant, who wanted him to do so. For the language defendant was fined 20s and court, and professional costs. The assault was dismissed. 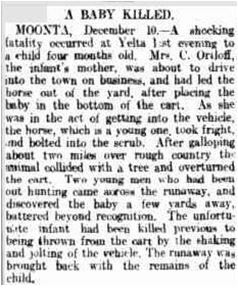 MOONTA, 1904 December 10 - A shocking fatality occurred at Yelta last evening to a child four months old. Mrs. C. Ortloff, the infant's mother, was about to drive into the town on business, and had led the horse out of the yard, after placing the baby in the bottom of the cart. As she was in the act of getting into the vehicle, the horse, which is a young one, took fright, and bolted into the scrub. After galloping about two miles over rough country the animal collided with a tree and overturned the cart. Two young men who had been out hunting came across the runaway, and discovered the baby a few yards away, battered beyond recognition. The unfortunate infant had been killed previous to being thrown from the cart by the shaking and jolting of the vehicle. The runaway was brought back with the remains of the child. 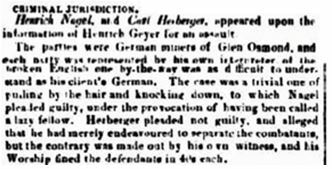 Henrich Nagel, and Carl Herberger, appeared upon the information of Heinrich Geyer for an assault. The parties were German miners of Glen Osmond, and each party was represented by his own interpreter of the broken English one by-the-way was as difficult to understand as his clients German. The case was a trivial one of pulling by the hair and knocking down, to which Nagel pleaded guilty, and alleged that under the provocation of having been called a lazy fellow. Herberger pleaded not guilty, and alleged that he had merely endeavoured to separate the combatants, but the contrary was made out by his own witness, and his Worship fined the defendants in 40's each. Now that the summer is setting in, disinfectants should be more generously used in and about the water closets. There are outhouses where nothing is used - judging by the very bad odour which arises therefrom upon a summer’s evening. It is an infliction to have to pass within ten yards of these - as often has to do, unless he takes to the middle of the road. 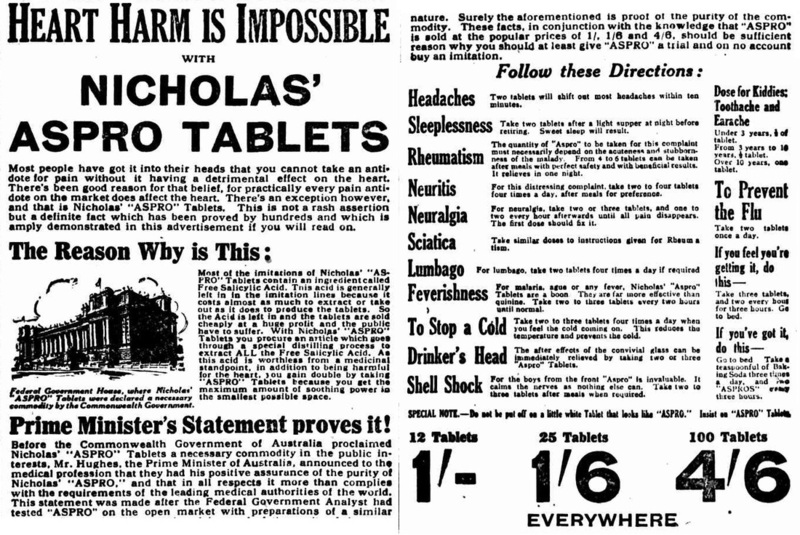 Surely disinfectants are sufficiently cheap to enable house holders to keep a stock. 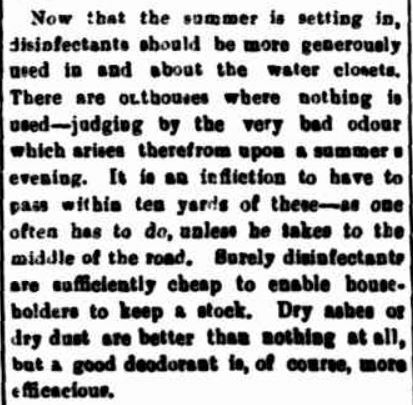 Dry ashes or dry dust are better than nothing at all, but a good deodorant is, of course, more efficacious. A most disgraceful case of neglect on the part of a medical man occurred at Daisy Hill a few days since, which resulted in the death in childbed of a Mrs. Kirkham. The facts of the case are as follows :-Mrs. Kirkham, the young wife of a digger, was about being confined of her fourth child: she employed Dr. Hadon as her medical attendant. When she was taken ill, and expected hourly to be confined, her husband went several times for the doctor, who, however, refused to come, alleging that "it was all right, and there was no hurry." On one occasion he said to Kirkham, when informed by him that his wife was dying, "she might die, and be d-d." After considerable delay Dr. Hadon made his appearance at the sick woman's cottage, but instead of giving her any assistance he got drunk, and in that state lay on the bed beside her. While he was there, one of the witnesses deposed, the deceased complained of great pain, and asked Dr. Hadon to help her. He refused, and told her to lie still. Ultimately two other medical men were called in, but they arrived too late to be of any assistance, and the poor woman died immediately on being delivered of a dead child. An inquest was held on the body before J. M. Girdlestone, Esq., coroner, when the following verdict was returned: "That Ellen Kirkham died from exhaustion after child-birth; that death was caused by one Hadon, who was her medical attendant during her labor." 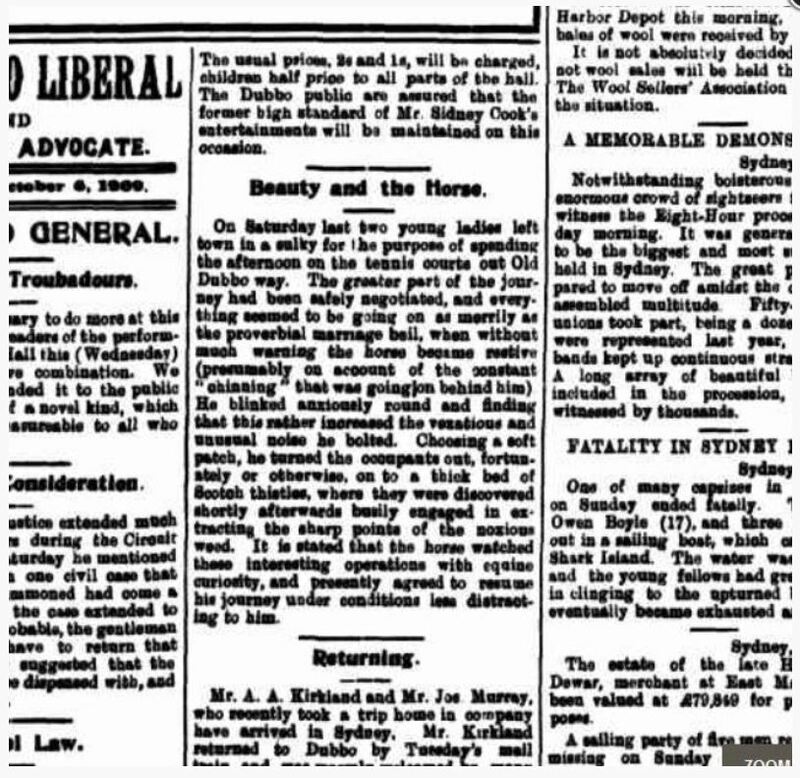 A warrant for the apprehension of Dr. Hadon was issued by the coroner immediately on the verdict being known, but he had absconded prior to the inquest. The police are, however, on his track. We may thank the appointment of a very active and efficient coroner, Dr. Girdlestone, for the publicity which has been given to the above case. One hears of such terrible accidents from fire that everyone should know what to do in an emergency. Women and children are more liable to be set on fire than men, as their dresses are usually made of more inflammable material. The very first moment you discover you are on fire, instantly lie down and roll over and over, where ever the flames may be. Do not scream or run for water, or even for a blanket. You can do more for yourself the first few seconds than a host of friends, together can do afterwards. Fire cannot burn without air, so to smother the fire is even a surer way of putting it out than pouring water on the flames. 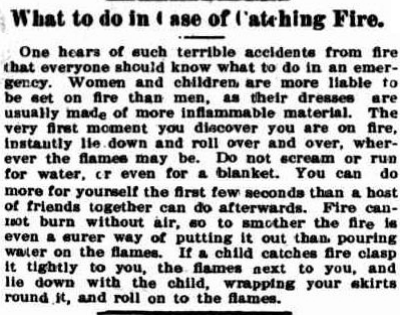 If a child catches fire clasp it tightly to, you, the flames next to you, and lie down with, the child, wrapping your skirts round it, and roll on to the flames. © 2013 - Suzanne Nagel.